Newest technology full glue on the entire back of tempered glass screen protector for galaxy S8. You must read before you install this screen protector. 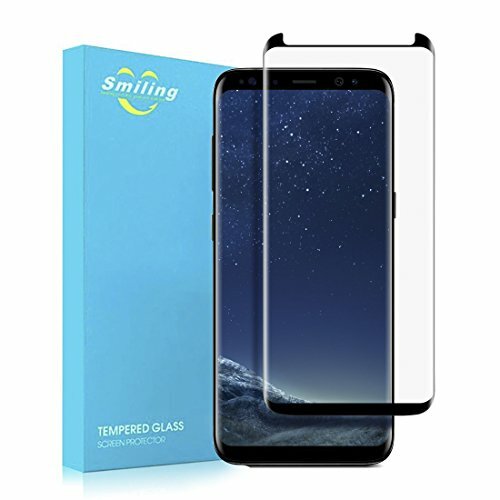 How to install this screen protector? may come to be one bubble when you apply the screen protector . How to remove stubborn bubbles on the edge ? much),and use your another hand finger push the bubble to the edge. How to remove the bubble in the central of the screen protector ? protector till the bubble and re-install it . Re-install it again if bubbles can not remove or not perfect! protector maybe cracked if you lift the screen protector quickly. Innovative Design:Newest technology designed for galaxy s8 tempered glass screen protector ,with full glue on the entire back of the screen protector(same like iphone screen glass protector) not like others only have glue on the outer edges of the screen protector . Easy installation:the bubble in the central of the screen protector will go out by themselves ,and the bubble on the edge need you push them out by your finger ,almost like you install one iphone screen protector . Touch Agility:Full glue technology ,every part of the screen protector stick on the phone screen,it like direct to touch on the phone screen if you touch on the screen protector . Case friendly:Smaller than the phone screen design to fit for most of cases ,little space on the out edges from the phone screen ,the case will peel off the screen protector and come to be bubble if your case not fit the screen protector ,please re-install this screen protector and change another case.